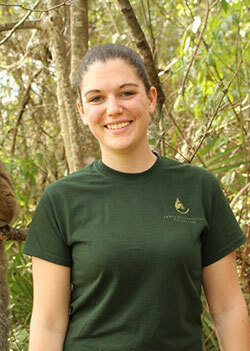 Born and raised in North Attleboro, MA, Caitlin studied conservation and wildlife management at Delaware Valley College. While earning her BS degree, she volunteered at Elmwood Park Zoo in Norristown, PA, and also served as an animal care intern in the North America West section of the Buttonwood Park Zoo in New Bedford, MA. There she worked with native species, including cougars, bobcats, deer, and bison, and target-trained an ornery Canadian lynx. After graduation, Caitlin accepted a position at LCF as an animal husbandry intern, quickly falling in love with the lemurs and the unique setup of LCF’s free-ranging forests. Promoted to keeper and now zoological manager, Caitlin has experience working in many areas of the reserve, including animal husbandry and training, recordkeeping, veterinary assistance, event planning, and running LCF’s social media pages. In addition to her daily work, Caitlin also spends her free time taking pictures of the lemur colony. She is currently the keeper of the ring-tailed lemur studbook for the Association of Zoo’s and Aquarium (AZA) Prosimian Taxon Advisory Group, and is also assisting with the ring-tailed lemur Species Survival Plan (SSP) update and animal care manual.